Gomal Medical College is located in D.I.Khan; the southernmost district of Khyber Pakhtunkhwa, situated on the right bank of River Indus. It is about 300 km south of Peshawar, on main Indus highway from Peshawar to Karachi. The College was initially affiliated to Peshawar University, Peshawar. Since 2010 it is affiliated to Khyber Medical University, Peshawar. The College was permanently recognized by PM&DC in 2007. 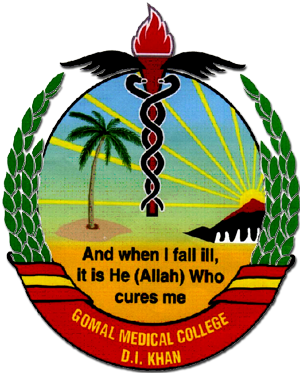 Gomal Medical College offers MBBS Admissions every year. Gomal Medical College announces online registration system for the candidates appearing in the Educational Testing and Evaluation Authority (ETEA) test for the admission in all Public and Private sector Medical/Dental Colleges/Institutions of Khyber Pukhtunkhwa. ETEA Entrance Test 2019 or Admissions in Medical and Dental Colleges of KPK will be held simultaneously at three different centers. Every year increasing number of candidates appear in ETEA Test. ETEA Test is a mandatory Test to get admissions in the institutions of KPK. The entrance test shall be held on 23rd July, 2019. The registration can be made online. Entrance test shall be conducted by Educational Test & Evaluation Authority (ETEA). Candidate who has passed FSc Pre-medical or Equivalent examination with a minimum of 60% marks is eligible to apply for this test. A candidate who has appeared in FSc Pre-medical Part-II or Equivalent examination is awaiting the result can also apply. Students already admitted in MBBS or BDS on provincial seats, are eligible to reappear in the Entry Test if they have resigned/ withdrawn their admission and paid the prescribed penalty. Entrance test scratch may be obtained from designated branches of Allied Bank at the cost of PKP: 1500/-. Students may enter the scratch card number at KMU website, and after entering the number, they will be allowed to fill in the online application form. Entrance test scratch card will be available from 23rd June, 2019. Online registration will also be open from 14th July,2019. On the basis of ETEA Entry Test results, students can apply for admissions in Gomal Medical College, D.I.Khan. Certificate of residence on a court Paper ( In case of Pakistani Residents only; as per the specimen placed in the admission kit). English language expertise certificate (In case of Foreigner).